Urinary incontinence is the involuntary loss of urine as a result of problems controlling the bladder. In Functional Urinary Incontinence, however, the dilemma extends in reaching and utilizing the toilet when the need emerges. The person has normal function of the neurological control mechanisms for urination. The bladder is able to fill and store urine properly. The person is able to recognize the urge to void. There are many possible causes of functional incontinence. Often, it involves environmental barriers that make it difficult for the person to get to an appropriate place for voiding. Also, another cause is a problem that prevents the person from moving instantly to get to the lavatory, remove clothing to use the toilet, or transfer from a wheelchair to a toilet. This includes musculoskeletal problems such as back pain or arthritis, or neurological problems such as Parkinson’s disease or multiple sclerosis (MS). In the long run, the person may have alterations in body image and self-concept following the person’s feelings of shame and embarrassment due to soaked clothing, urine odor, and the loss of independence for toileting. Patient receives assistance for toileting in a timely manner. Patient reduces or has no incontinent episodes. Patient eliminates or overcomes environmental barriers to toileting. Patient uses adaptive equipment to reduce or eliminate incontinence related to impaired mobility or dexterity. Patient uses portable urinary collection devices or urine containment devices when access to the toilet is not feasible. Complete a focused record of the incontinence including duration, frequency and severity of leakage episodes, and alleviating and aggravating factors. This provides evidence to the causes, the severity of the condition, and its management. Assess the patient’s recognition of the need to void. Patients with functional urinary incontinence are incontinent because they are unable to get to an appropriate place to void. In some cases, functional incontinence may result from problems with thinking or communicating. A person with Alzheimer’s disease or other forms of dementia, for example, may not think clearly enough to plan trips to the restroom, recognize the need to use the restroom, or find the restroom. People with severe depression may lose all desire to care for themselves, including using the restroom. Assess patient for potentially reversible causes of acute/transient urinary incontinence (e.g., urinary tract infection [UTI], atrophic urethritis, constipation or impaction, sedatives or narcotics interfering with the ability to reach the toilet in a timely fashion, antidepressants or psychotropic medications interfering with efficient detrusor contractions, parasympatholytics, alpha adrenergic antagonists, polyuria caused by uncontrolled diabetes mellitus, or insipidus). Transient or acute incontinence can be reduced or eliminated by reversing the underlying cause. Assess the availability of functional toileting facilities (working toilet, bedside commode). Bedside commode is necessary for an immobile patient. Assess patient for established/chronic incontinence: stress urinary incontinence, urge urinary incontinence, reflex, or extraurethral (“total”) urinary incontinence. If present, begin treatment for these forms of urine loss. Functional incontinence is often accompanied with another form of urinary leakage, particularly among the elderly. Assess the patient’s ability to get to a toileting facility, both independently and with help. This information allows the nurse to plan for assistance with transfer to a toilet or bedside commode. Functional continence requires the patient be able to get to a toilet either independently or with assistance. Functional continence demands access to the toilet; environmental barriers blocking this access can produce functional incontinence. 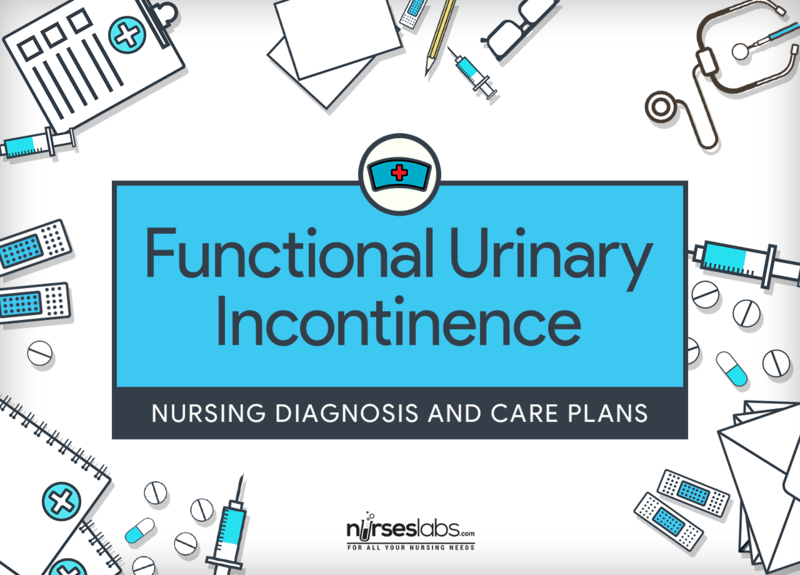 Assess the patient’s normal pattern of urination and episode of incontinence. This information is the source for an individualized toileting program. Many patients are incontinent only in the early morning when the bladder has collected a large urine volume during sleep. Assess the patient’s need for physical assistive devices such as a cane, walker, or wheelchair. Functional continence requires the ability to gain access to a toilet facility, either independently or with the assistance of devices to increase mobility. Assess patient for dexterity, including the strength to manage buttons, hooks, snaps, Velcro, and zippers needed to remove clothing. Consult physical or occupational therapist to promote optimal toilet access as indicated. Functional continence requires the ability to remove clothing to urinate. Assess cognitive status with a NEECHAM confusion scale (Neelan et al, 1992) for acute cognitive changes, a Folstein Mini-Mental Status Examination (Folstein, Folstein, McHugh, 1975), or other tool as designated. Functional continence needs satisfactory mental acuity to respond to sensory input from a filling urinary bladder by locating the toilet, moving to it, and emptying the bladder. Set a toileting schedule. A toileting schedule guarantees the patient of a designated time for voiding and reduces episodes of functional incontinence. Eliminate environmental barriers to toileting in the acute care, long-term care or home setting. Help the patient remove loose rugs from the floor and improve lighting in hallways and bathrooms. Loose rugs and inadequate lighting can be a barrier to functional continence. Place an appropriate, safe urinary receptacle such as a 3-in-1 commode, female or male hand-held urinal, no-spill urinal, or containment device when toileting access is limited by immobility or environmental barriers. Provide privacy. The patient must take this alternative toileting facility. Some people may be ashamed when using a toilet in a more open area. Assist the person to change their clothing to maximize toileting access. Select loose-fitting clothing with stretch waistbands rather than buttoned or zippered waist; minimize buttons, snaps, and multilayered clothing; and substitute Velcro or other easily loosened systems for buttons, hooks, and zippers in existing clothing. Clothing can be a barrier to functional continence if it takes time to remove before voiding. Women may find skirts or dresses easier to wear while implementing a toileting program. Pants with elastic waistband may be easier for men and women to remove for toileting. Prompted voiding or patterned urge response toileting has been revealed to considerably lessen or eliminate functional incontinence in selected patients in the long-term care facility and in the community setting. Tell the patient to limit fluid intake 2 to 3 hours before bedtime and to void just before bedtime. Restricting fluid intake and voiding before bedtime reduces the need to disrupt sleep for voiding. Manage any existing perineal skin excoriation with a vitamin-enriched cream, followed by a moisture barrier. Moisture barrier ointments are beneficial in protecting perineal skin from urine. Monitor elderly patients for dehydration in the long-term care facility, acute care facility, or home. Dehydration can intensify urine loss, produce acute confusion, and increase the risk of morbidity and mortality, especially in the frail elderly patient. Explain to patient and caregiver the rationale behind and implementation of a toileting program. Successful functional continence requires consistency in use of a toileting program. Educate caregivers and family members about the importance of responding immediately to the patient’s request for assistance with voiding. Functional continence is promoted when caregivers responding promptly to the patient’s request for help with voiding.